STOUGHTON, Mass. – If not for the perfect relay throw, Stoughton very well could have been looking at a different outcome against #9 Somerset-Berkley. Trailing by a run in the bottom of the seventh, senior Ruben Gonzalez, one of the fastest players in the area, hit an RBI triple that rolled to the edge of right field at Noviello Field at Stoughton High School. Gonzalez sped around third and nearly made the turn home but the perfect relay throw forced Stoughton head coach Mike Armour to hold Gonzalez at third with two outs. At the next at-bat. SB pitcher Chase Stafford induced a chopper down the third base line and the throw to first was just in time for the final out, giving the Raiders a 3-2 win over the Black Knights. Stoughton entered the bottom half of the inning facing a two-run deficit, down 3-1 after the Raiders scored twice in the second and once in the fourth. Stafford got the first two outs – a 6-3 groundout and an F8 – before Stoughton senior Zak Paquette battled his way to a walk. Gonzalez smacked the first pitch he saw into right, the ball rolling all the way to the edge of the playing field to bring pinch runner Cameron DiRosa home to make it a one-run game. Gonzalez nearly stole home, but on a 2-2 count, Matt Hadley was forced to put the ball in play and the senior came inches away from legging out the infield single to tie the game. It was a bright start for the Black Knights. Gonzalez led off with a single in the bottom of the first and went to third on a single from Evan Gibb. With sophomore James Genest at the plate, the ball got behind the catcher and Gonzalez took off for home, but the umpire called the speedy shortstop out at home. Gibb moved to third on the same ball and Genest singled into left field to give Stoughton a 1-0 lead. Somerset-Berkley loaded the bases with no outs in the top of the second inning. Kyle Vieira singled into center for a run before Paquette got the first out with an infield fly. Jacob Rebello hit one deep enough to center allowing the run to just beat Cian Swierzewski’s throw for a sacrifice fly and a 2-1 advantage. The Raiders tacked on a run in the fourth inning. Vieira and Rebello had singles and Matt Shea reached on a bunt and overthrow. That same overthrow allowed Vieira to come around and make it 3-1. After an intentional walk, Paquette got a pop up to right field and sophomore George Currier fired to first for a double play. Paquette followed up with a strikeout. Stoughton had a chance to strike back in the bottom of the fourth but uncharacteristic errors hurt the Black Knights. Genest singled and Currier followed with a one-out base hit of his own to put runners on first and second. 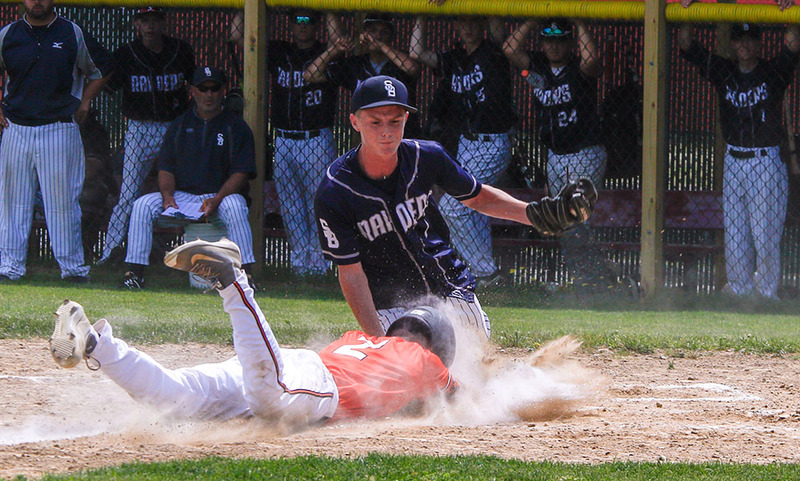 But a ground ball not only got the force out at second, Stoughton’s pinch runner accidentally overran third and the Raiders capitalized, firing to third and getting the tag. Swierzewski was hit by a pitch to lead off the bottom of the fifth but a sac bunt attempt turned into a double play when Stafford caught the bunt and fired to first. Stoughton baseball, which had just two players back from the 2017 squad with varsity experience, finishes the season at 10-9 overall. Six of the nine Black Knight starters are set to return next season. STOUGHTON, Mass. – It has been a long week for students at Stoughton High School. On Friday morning, the Black Knights baseball team were among the hundreds of students that attended the funeral of classmate David Bell, one of four Stoughton High students, along with Nick Joyce, Eryck Sarblah, and Christopher Desir, who tragically passed away in an accident this past Saturday. On Friday afternoon, the Black Knights took the field for the third time this season and came away with a 14-5 win over rival Canton, their second win over the Bulldogs this week. “There wasn’t a doubt in my mind they’d want to play today, I’m just so proud of these young men,” said Stoughton head coach Mike Armour. Many of the players on the team were teammates with Bell for football or basketball. 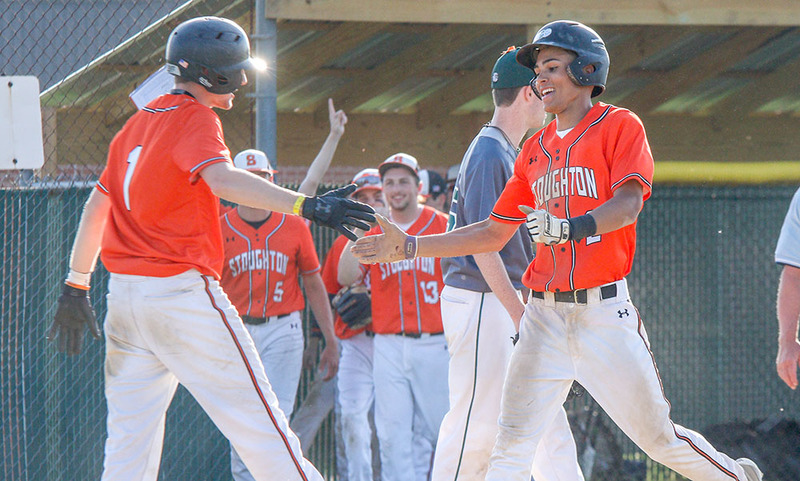 Stoughton’s offense had its best game of the season, scoring a season-high 14 runs on 16 hits. The Black Knights scored in every inning except the third, scoring at least three runs in the second, fifth, and sixth innings. Senior Ruben Gonzalez, who was teammates with Bell in both football and basketball, earned the win on the mound with two strikeouts in five innings of work. He walked four and allowed just three hits and three runs. Matt Hadley got Stoughton’s offense going in the bottom of the first with a one-out single. A pickoff error allowed Hadley to get to third and he scored on a groundout from sophomore James Genest for a 1-0 lead after one. The Black Knights had their best inning in the bottom of the second. Will Eckhart (walk), Cian Swierzewski (single) and Zak Paquette (error) all reached to load the bases with one out. Gonzalez and Hadley reached on back-to-back infield singles, each driving a run in to make it 3-0. 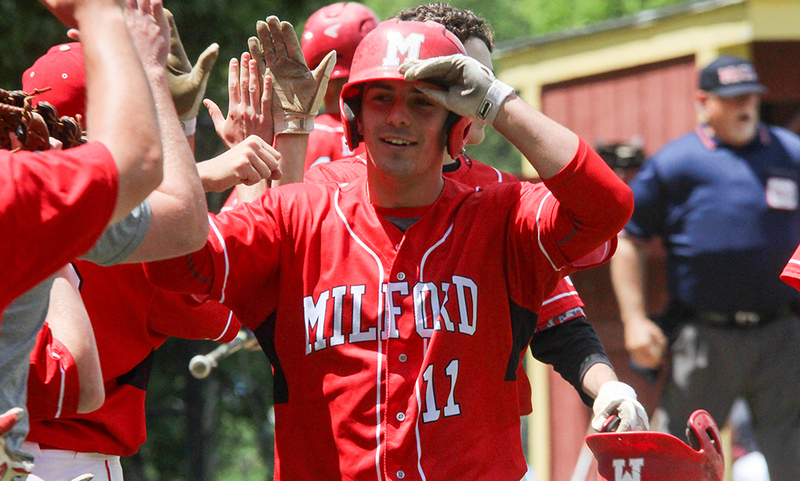 Evan Gibb drove in a run on a fielder’s choice to make it 4-0 and then a single from James Genest turned into two runs. Genest’s line drive to center was misplayed, allowing both Hadley and Gibb to score but Genest was thrown out at home on a nice relay throw from shortstop Nate Quan. Canton stuck back for two runs in the top of the third. Niko Donovan singled and then scored on a two-out inside the park home run from Matt Pigeon to cut Stoughton lead to 6-2. Stoughton loaded the bases in the fourth inning but Canton reliever Ryan Hickey limited the damage to one run. Gonzalez (double), Hadley (single), and Gibb (walk) were on base with one out. Gonzalez scored on a sacrifice fly from Genest to make it 7-2 but Hickey got the final out to escape further damage. Quan helped Canton cut into Stoughton’s lead with a run in the top of the fifth. Quan had a leadoff walk, took second on a walk to Tommy DiLello and scored on an RBI single up the middle from Hickey to make it 7-3. But Stoughton was quick to respond, scoring three runs in the bottom half. Swierzewski (fielder’s choice) and Paquette (single) were on first and second with two outs before Gonzalez ripped a shot to right-center field. Gonzalez used his speed to round the bases for a three-run inside the park home run, his third, fourth, and fifth RBI of the day. Mike Konzal led off with a triple for Canton in the top of the sixth and scored on an RBI groundout from sophomore Owen Lehane. An error allowed Rob Sullivan to reach, and a throwing error brought him to third and Lucas Bryant to second. Matt Casamento drove Sullivan in with an RBI single up the middle to make it 10-5. But the Black Knights put the game out of reach with four runs in the bottom of the sixth, all with two outs. George Currier got things going with a single and scored after a triple from Robbie Seaman. Eckhart followed up with an RBI triple of his own and scored on a single from Ryan Semler to make it 14-5. With the win, Stoughton qualifies for the postseason by securing a 0.500 record or better. The Black Knights were already headed to the playoffs because of a second place finish in the Davenport division. While the offense has been a constant throughout the season, Armour is excited about the progress of the pitching. Stoughton baseball (9-6 Hockomock, 9-8 overall) will finish the regular season with a visit from Sharon on Wednesday. Canton finishes the season 4-15 in the Hock and 5-15 overall.